We are still blown away by how beautiful guest Adrian van der Stel's photos are of the Australian birds and animals he spotted while out on a full-day Sydney coastal walk with us in Royal National Park a few years ago. This wasn't a birdwatching tour, nor a specific wildlife walk, but rather Adrian's photos are of the abundant wildlife spotted on a fairly ordinary day. Given more than 300 species of birds can be found within Royal National Park's boundaries – more than in Australia's lush Kakadu region – there are stunning photos of Sea-Eagles, Kestrels, Wattlebirds and Honeyeaters. If you're particularly interested in birdwatching in Royal National Park, you must get Steve Anyon Smith's detailed booklet Birdwatching in Royal & Heathcote National Parks. 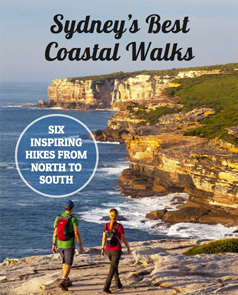 It's printed by the NSW National Park and Wildlife Service and as far as I know, Audley Visitors Centre in Royal National Park is the only place you can buy it. (Contact the visitor centre first to see if it's in stock). Alternatively, pick up Sydney Birds and Where to Find Them, or the ever-reliable The Slater Field Guide to Australian Birds. Adrian van der Stel's images include a very cute Echidna and Swamp Wallaby. Both are an unusual, but not uncommon, sight. There's probably a greater chance of seeing a Swamp Wallaby, simply because they're bigger. The quieter you are, the better the chance you have of spotting wildlife. Like birds, it's less likely to spot them in the heat of the middle of the day. While Royal National Park has varied native wildlife, it's missing some of the most popular Australian birds and animals. There are no kangaroos (wallabies are similar, but smaller), koalas or platypus. If you're keen to spot Australian birds and animals in the wild but only here for a short time, try joining a wildlife tour. This tour by Boutique Tours departs Sydney and heads to the lovely Southern Highlands, with guides who know exactly where to go to increase the chance of spotting wildlife, including the elusive platypus. If you'd like to see animals for yourself, check out the six best whale watching places in Sydney to inspire your next adventure in nature. Tagged Flora & Fauna, Inspiration, Royal National Park. Thanks for the kind words Tara. The tour was absolutely fabulous and I will be trying to schedule some time to get down there again and just sit and observe the wildlife. A truely pristine part of Australia right on Sydney’s doorstep. Thanks for the memorable experience!